While today, the Christmas holiday is not celebrated by Jehovah’s Witnesses, this was not always the case. From the Watch Tower Society’s founding up to the 1930’s, Christmas was not viewed as a pagan holiday and was celebrated. Even back then, the cross was not viewed as a pagan symbol as it is now and the symbol of the cross appeared on every issue of the Watch Tower magazine up to October 15, 1931. Below are two photographs. 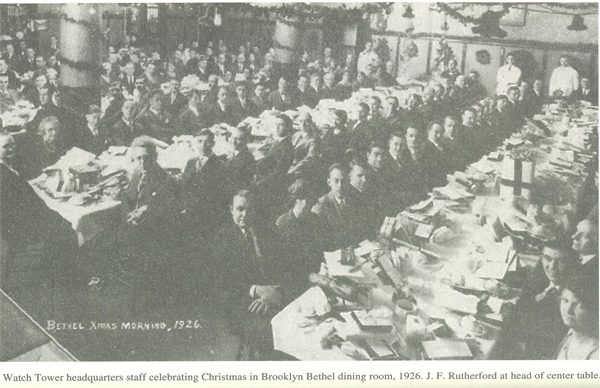 The first is a photograph of the Watch Tower headquarters staff celebrating Christmas in the Brooklyn Bethel dining room in 1926. J.F. Rutherford sits at the head of the table. The second photograph is of a January 1, 1931 Watch Tower magazine. Notice the symbol of the cross in the upper left corner. 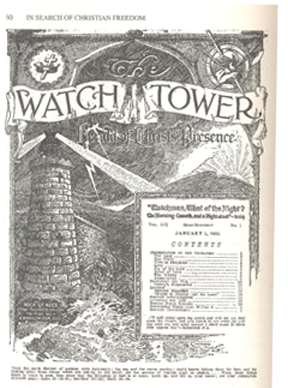 October 15, 1931 Issue of the Watchtower Magazine – Notice the Symbol of the Cross In the Upper-Left Corner. The point of this short article is not to express,”See, Jehovah’s Witnesses did celebrate Christmas or believed in the cross.” No, but rather to show that error can be taught as truth. At one point in it’s history, the Watch Tower Bible and Tract Society thought the Christmas celebration, the cross, and even smoking were OK. In many places in the Southern United States – and for quite some time – the congregations were segregated. African Americans did not sit alongside Whites and they did not use the same washroom facilities. Of course, today, that is not the case. It stands to reason, then, that some of what is believed to be true by the Watch Tower organization today could also be in error. Most Jehovah’s Witnesses are not aware that the 1914 date did not originate with the Watch Tower organization. The date borrowed and adopted by the Watch Tower Organization founder, Charles Taze Russell, who became a Second Adventist and contributing editor of their Herald of the Morning magazine. The 1914 date originated with a man by the name of John Aquila Brown – an Englishman – in 1823, twenty-nine years before C.T. Russell was born and forty-seven years before Russell started his Bible study group. See article 1914: A Hope Deferred. Such examination and testing of expressions and utterances claiming to be inspired by God, does not exclude the Watch Tower organization or any human or human agency. A Disciple of Christ in the strictest sense. I belong to no religious organization. I view Christ as my only Head, Master, Teacher, Owner, and Lord. (John 8:31-32, 1Cor 11:3) His God is my God and I champion his teachings above anything issuing out of ANY religious organization. The 144,000, Who Are They? The 1914 date is not in error by several prophecies and by calendar facts. The 360-day calendar and ALL 365-day calendars exist as one tree branching to all calendars by one fact (Adam 4025bc to Flood 2370bc). This fatc produces 4344 years of 360-day that begin year 6000 in 1913 to end in 1914 where upon the 3 days (June 28-July 1) of the shooting of the archbishop were the application and acceptance of the British license which is global and will not be destroyed , cannot be destroyed nor invalidated until all 144,000 are in heaven. If it were, the nations would be destroyed for breaking a license jehovah bought. He doesnt care about the watchtower license any more than caring what mother Mary did with her damn life. It is the child Jesus or the IBSA that he is projecting as his presence. The 1914 is supported not only as year 6000 since (our 1984), but has also been rebuilding the temple and city in 7 weeks of Jubilee since 1914 from 537bc, and every event until the BIble ends in year 443bc (32nd year of Artaxerxes and its 50th jubilee of 7 weeks in our 2008-2009). For those who dispute the 9-year difference of Artaxerxes (9 years not 10) year 41 is not 51. The difference is Egyptian date Jewish lunar was not used by Artaxerxes but rather Persian date Babylonian lunar. Example 2009 Aug 18-19 is Jewish Elul 1 for the moon, but in Babylonian the Moslem Ramadan 1 is Aug 20-21 (announced by Obama that morn on Turkish television while I awaited permit to ascend Mount Ararat to get the written records off the ark. Next, the 40 years since whole-year 6000 (1975-1976) is punishment against his witnesses because they did not piut his name on themselves in a choice to be righteous, but rather he put his name on them to fulfill king Darius stating God's name is on the temple, and then finished the 144,000 count in the 4 years of king Darius. The fact that they have his name, by his choice, means they comply or be destroyed as Jews were by babylon and by Rome. They will be destroyed in this manner. Israel was 600,000 and were not ready for Promised land out of Egypt, so they were killed and the 600,000 children replaced them. So it is with 7 million JWs, 7 million JWs are destroyed and 7 million JW children replace them. How so? because in 1985 February they did not obey the command to eat food without carbon-14. Peleg ate 30 years and died at 239 while his father was young and lived 191 years past all his descendents to 464, not being weak and feeble until probably 450. Peleg's 30 years killed him, and not Nimrod who lived to be 500 and died in 1770bc on April 22. EVERYTHING past and future can be calculated precisely. Ask, we can do it, ask i can do it, ask how you can do it. The difference is future can be changed by avloiding what you know. Past when changed is reconstructive lying. When this asteroid hits this year. JW children do not have the faith to move on. Older ones were strong (though wrong) and they are needed to drag their children thru, knowing that they the parents will still age and die after Armageddon for not purging the carbon-14. Young people do not have to purge, when you see the carbon coming soon, you will see very well how C-14 toxic to all organic DNA in all organic life is being purged. Green-house is what God wants, and no one can stop it. You slam the watchtower so do i slam it. I slam it like i slam king Saul who threw a spear at David. I slam it like priest Eli whose sons devirginized female virgin minors so that new husbands got used goods. So many of you keep saying God is with the current Jews no matter what Jews do. So how is it you can say that a religion God has raised is not his because it is corrupt again. Hypocrites, like JWs you hate the sins of others that you excuse who you want. The JWs are all YOU the world who pretend they change when baptized and havent. So you curse them for what YOU do, and for what YOU were, and YOU are, but you refuse to see it is YOU becoming JWs and staying the same trash that YOU all are. Jehovah moves on without you, but he still proves that he laid out the plan with the British IBSA from 1914 to 2009. The last book Malachi says look for Elijah who will condemn his own people before they are saved. That book was written in 443bc and honored by my ascent to Ararat in 2009 as commanded by Jehovah. I keep saying to Jehovah, to Jesus, to his unfinished bride in heaven that everyone in the org, in the world, out of the org needs a sign of resurrection BEFORE armageddon. Before the 144,000 are killed and they ascend, someone needs to awaken from death to shame these wicked people, and prove that they will not believe this person who is raised. Your reply shows loyalty to men and their organizations rather than to Christ. The WTBTS says that it does know. So the WTBTS is claiming it knows what Christ does not know. Thus, delving into dates “to know” and ascertain prophetic events does not belong to any human or angelic creature. They belong only to the Father. I cease to engage in emotionally-driven discussions as I find they get in the way of reason and clear thinking as many people would rather prositute themselves with religious organizations rather than listen to what Christ himself has said. With regards 1914 there is no discussion as Christ has spoken concerning his return and the knowing when it would occur. The WT is completely off-base here and has built a “prophetic” foundation of teachings upon this date. If the date is false and cannot be known by humans, angels or Christ, then anything bulit upon that foundation is false. Additionally, the 1914 date (if it were true and it is not), did not come out of the WT organization. UPDATE: 40 years punishment from year 6000 in 1975 is added to the 60-year difference of 360-day ending 6000 before it. Apparently it is the words of an organization that has taken precedence over the words of Christ. In my previous response I quoted the words of the Master at Matthew 24:36, Matthew 24:42 and Acts 1:7. Millions ignore what he said with regards dates and no one but the Father knowing when he would return. Publishing any date implies “knowing” when the Lord came. 1914 is such a publishing of a date. It should be of note that it was the evil slaves (unfaithful ones) within Jesus’ household who were concerned with dates and times. Why? Because they felt that he was delaying. That they felt this way means that they were expecting him at a certain time. It was the faithful slave who was not concerned with dates and times. They listened to the Master and stayed awake. I am such a slave and I listen to Christs words at Matthew 24:42. That 1914 has been published by the WTBTS as the date of Christs’ return, means that the organization sees no need to stay awake as it believes that Christ has already returned and is here.Therefore, the WTBTS has fallen asleep and it has not listened to Christ or God’s command at Luke 9:35 to “listen to” His Son. The WTBTS imitates “resister” and opposes Christs words in the Scriptures listed above. The WTBTS says that it knows what Christ says that he does not know and it has done so arrogantly. There is much resistance in listening to what Jesus had to say about this. This is most concerning to me. What is also very concerning is that my former Brethren (JWs) either do not address this or steer away from it. What has such a hold on ones thinking that they would not link the falseness of 1914 with what Jesus said? ” … you do not know on what day your Lord will come.” Says the Master. So no, 1914 irrelevant and false and has misled a great many.